Social media has ushered in a new age of direct engagement encompassing almost every aspect of contemporary life. Social networks afford us the ability to share ideas and connect with our communities and to serve to remind us that we are never alone. The 'thumbs up' symbol used ubiquitously by Facebook, is an interesting portal into the examination of our contract with social media. A stylized like symbol (or thumbs up) is relatively impotent in itself, yet behind symbol are algorithms designed to discern our personalities. Just as our personalities differ widely, so to do our physical hands. Building on ideas of consumer identity from previous series; 'Who Likes You?' simply examines the social contracts we exchange with ourselves, others and the corporations the run social media hubs. David Stephenson Likes: 3 panels (2013) Painting, Acrylic on Canvas. 100cm x 80cm. 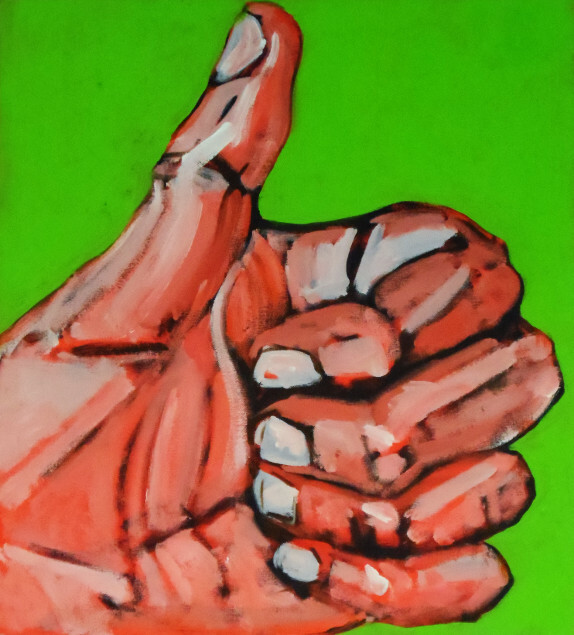 David Likes (2013) Painting, Acrylic on Canvas.